Poll: Should the OB Planning Board Hold a Design Contest for a New Logo? Former OB Planning Board logo. Recently, the OB Planning Board changed the logo that the Board has used for nearly 4 decades. They did this without much fanfare due to the request by Bob Sorben, the originator of the iconic OB seagull image, as the Board’s logo looked very similar. Sorben had copyrighted his image. His request for the planners to change their logo had been made a couple of years ago in a phone conversation with someone from the then-Board. So, a few of the current Board members took the initiative and designed a new logo for the planning committee. The new image began appearing on agendas and other Board documents. But there was no discussion about the new design – as far as we can tell. A number of folks in the community took slight umbrage at this brazen act by the current Board, as the Board’s logo had been around for so long, and as some felt Sorben’s request was off-mark because it was so late in the game. Without disparaging the guys who came up with the new OBPB logo design, we believe that the Board should hold a design contest for a new image. One of the reasons we think this is because there’s the constant efforts to get OBceans involved with their Planning Board, and this design contest would be an excellent way for people to get involved with the Board and allow the process to be more democratic and inclusive. The design that has become “official” could be one of the design entrants to the contest. The OB Rag just ran a poll and nearly 75% of the respondents voted that the OB Board should hold a design contest. Again, just to reiterate, we have no problem with the current leadership or direction of the OB Planning Board, we just think that the current Board members ought to know that there are lots of folks out there who identify with the Planning Board and who were part of it over the past nearly 40 years (1976 – today). All I see when I see the new design is DB or a male anatomy parts. As a graphic designer for 12 years now, its pretty bad. Sorry to say..
Obviously, if OBceans don’t care, we’ll drop the whole issue. But so far, enough do care and the issue is alive. Okay, maybe it’s ‘all about nothing’, but it also could be fun – and INCLUSIONARY – and hopefully the Board members will see it in that spirit – and not get defensive. What’s the big deal about this? Was there a public vote on the new logo by the OBPB? Vote by plan committee = vote by community. Minutes will show. I don’t know if there was a vote by the board on the new logo as I was not there and don’t remember it being talked about in a OBRAG article. Mean to say that when the board voted on it, they are our representatives – that means democratically the community voted on it. Are not there more important things to be concerned about? I personally like the new parrot. A contest sounds like a great way to engage the public….why not? Make a celebration out of it after the vote in and have a beach BBQ ….where people can order logo wear. If the OBPB comes up with a cool design (or maybe the parrot thingy will win) the sale of short and long sleeve shirts can give the OBPB funds to use. Maybe banners could be made and placed on the new poles in OB that have cell towers and surveillence cameras (not sure if there are cameras or not). This is a decision you should trust the OBPL to make. A contest sounds like great fun, but I for one would not be willing to do the significant work of organizing it. The OBPB has done a stellar job of representing and fighting for OB on significant issues. I don’t think they should get any time-wasting static about a logo. OBW I live in “Point Loma” so take my comments for what they are worth. Now that I think of it, I can’tremember what the PCPB logo looks like. Petty things to worry about, work on the parking issue the Coastal commission mentioned . 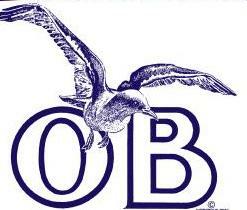 To reiterate what has come before: There is no getting around that OB is most known and recognized by the seagull logo representation. Even if the logo needs updating, a “peaceful” dove in a better pose might be worthy where the Parrot is nonsensical. Then the issue of a “real” readable OB is still needed not a brain freeze contraption that is almost indecipherable. The “peace sign” was integral to my recollection of OB when I was a teenager in the 60’s. If creating a new design is required, as it seems, I think community input into a community group’s identity crisis is the appropriate and logical solution that would be accomplished community wide with a “contest”. Certainly after all this time there can not be any time constraints for such a worthy endeavor necessitating a rush to judgment. As to if it worthy of contemplation, what else is more worthy than one’s identity, self and/or community? OBPB work it out please. As mentioned above, the new logo says db (doucebag) and looks phallic. Have a vote on a new one please. I would submit a design and am sure other locals would love to as well! It looks like the original..just moved couple things around..all in all pretty dreadful looking..they not only need to find a new logo..they need to hire a graphic artist as well!